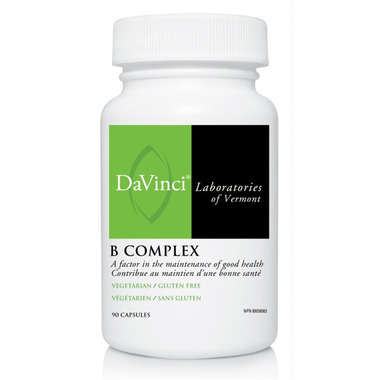 DaVinci B Complex is a natural health product to help maintain good health. It is available in a vegetarian, gluten free, and easy to swallow capsule. It contains the active form of vitamin B12 (Methylcobalamin) and contains Quatrefolic brand Folate L-5 MTHF, which is a highly bioavailable form of folic acid. B Complex contains Thiamin (B1), Riboflavin (B2), Niacin (B3 as niacinimide), Vitamin B6, Folic Acid, Vitamin B12, Biotin, Pantothenic Acid (B5), PABA, Choline and Inositol to support normal growth and development. As well, it helps to form red blood cells and tissue formation. Dosage: Adults: As a dietary supplement, take1 capsule with a meal, or as directed by your health care practitioner. Cautions: Consult a health care practitioner prior to use if you are taking sulfonamides or if you are pregnant or breastfeeding. Known Adverse Reactions: Hypersensitivity (e.g. allergy) has been known to occur; in which case, discontinue use.